Matt Lerner of WalkScore.com and I recently exchanged emails about WalkScore’s “Transit Score” product, which provides a two-digit score supposedly capturing the usefulness of transit at any address in the USA. It’s designed on analogy to the successful (if still controversial) Walk Score, a similar tool for summarizing how friendly a place is to walking. For example, 300 Turk Street, San Francisco is scored 100 (perfect) on both Walk Score and Transit Score. Toward another extreme, here’s 7000 Lake Mead Blvd in the far east of Las Vegas. Walkscore is 52, Transit Score is 33. Tools like these have huge potential relevance to the real estate industry, and more broadly to anyone who makes locational decisions about anything. To the extent that we encourage people who value transit to locate where good transit is viable, everyone wins. Earlier, Matt’s team had created a “transit travel time tool” which can be used to show you the actual area you can get to in a specified amount of time. I used this tool as the core of my definition of mobility, in one of this blog’s earliest posts. So which is more useful, the simple two-digit Transit Score, or an actual map of where you can get to in a given time? The first draft of the book I’m writing … praises this WalkScore tool in some detail, as a way for people to understand the degree of freedom that transit will offer them. 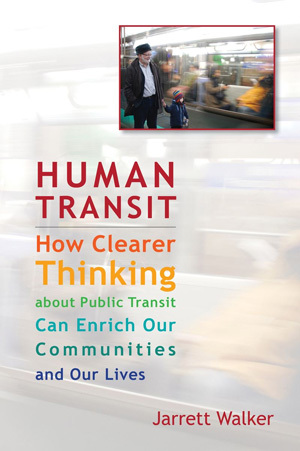 I think it may be a crucial tool for helping people see beyond modal fetishes to understand how transit actually works and how to determine if transit can actually get you where you’re going. In short, whereas the earlier tool presented raw information in a compelling way that the user could use for her own purposes, Transit Score contains value judgments (“we know you’d rather ride a slow streetcar than an express bus”) which the user may not share, and thus may be an obstacle to her ability to make transit meet her needs. So I guess I will praise mapnificent.net instead. This issue sits at the very foundation of my current book, so as an admirer of your work, I’d like a better understanding of why you abandoned the original accessbility tool. Was it a matter of the processing required to do what’s basically a massive search of trip planners? I can see that Transit Score is a much faster calculation, but wonder if that was the key issue. You’re right that we are promoting Transit Score over Transit Time Maps — but we haven’t abandoned the transit time maps. We are working on new ways to use them and they are still available here: http://www.walkscore.com/transit-map.php). Here’s why we’ve been promoting Transit Score more heavily. Our mission is to promote walkable/transit friendly neighborhoods and we think the best way to do this is to have Walk Score / Transit Score on real estate listings. As we developed Transit Score we looked at a few methods of calculating a Transit Score. The two finalists were our current method (detailed here) and a method where we summed the Walk Score under the area of the transit shed in our Transit Time Maps. In practice, the scores were very similar between the two methods so we chose the current method which is much easier to scale (we show millions of scores per day). We want to boil down transit access into a score so that it can appear on real estate listings and people can compare locations. ZipRealty.com has added our Transit Score to millions of listings and we have some more partners on the way. We did not see a lot of consumer/partner interest in the transit time maps — which is unfortunate because of course I love them. One scenario I’m hoping to promote with our Transit Time Maps (we just need a partner) is to allow people on real estate sites to search by transit time. E.G. find me an apartment within 30 minutes of work on transit. I’d also like to integrate the transit sheds into the standard Walk Score experience. I like the simplification Mapnificent made which was to not include walking time in their transit sheds — this makes it much easier to compute. So to sum up, I like your suggestion of avoiding any mode weight value judgments — it just turns out that in practice our current method was very similar and easier to scale. Anyway, would love to hear your thoughts on this. Also, we’re launching a beta of “Street Smart” Walk Score later this month and we’d love your feedback on that too. Thanks! … Suppose, hypothetically, that you had the processing power and datasets to run a purely mobility-based Transit Score. Let’s call it a Transit Mobility Score. The algorithm would be something like: Identify the area reachable in 30 minutes on transit from the selected point (I choose this because it seems to have a long history as an acceptable commute time). Then, grab the MPO’s database of population and jobs by small zone and calculate the percentage of the region’s jobs and population that are in that 30 minute band. That also gives you a 2-digit number, but now it’s a fact rather than a score. You’re saying: “If you locate here, you’ll have convenient transit access to __% of the region’s activity.” And that strikes me as something that a realtor could value, understand and explain. How far are you (or someone) from being able to do that kind of algorithm? Obviously you’d need to have the MPO on your side, so start with somewhere like Portland where they generally are. Frankly, you’d probably want to do two such scores, one based on your mobility at 8:00 AM and another for your all-day mobility — say, at 1:00 PM. But I think a realtor could make sense of those too. Everyone understands that transit in the peak is different from midday, and that both matter. Suburban areas, especially those under the influence of commuter rail and commuter express buses would show quite a difference between the two. I still think this could be huge. What if everyone making a locational decision could go to something like the WalkScore travel time tool or Mapnificent and see a map of where they’ll be able to get to in 30 mintues on transit? It would finally make our mobility visible. And if we could measure our mobility so accurately, for so many hypothetical cases, we just might value actual mobility more, and be less distracted by unreliable symbols of mobility — like, say, whether there are rails in the street. Technophiles shouldn’t be too alarmed; many people will still have modal preferences. But meanwhile, those of us who just want mobility would be able to measure it, fast, for anywhere that we might be locating something, including our homes. Halcrow, the transport/planning consulting firm that I work for, has done just this sort of analysis, developing an ‘accessibility index’ that could then be used to assess the impacts of various transportation policies (infrastructure investments, but also travel demand management (including road pricing, parking charges, etc) and transport-related land use policy changes). I’m checking internally to see how shareable that experience is (it’s ongoing work that hasn’t yet been finalized by the client), but hopefully I can send you a methodology within the next couple of days. The one caveat is that it is survey and model based and not as fine-grained as an address-by-address approach. It’s a bit more ‘policy’ oriented, as a result, rather than ‘property’ oriented. But real estate value is very much about symbols, not utility. If it was about utility the quality and efficiency of your furnace would affect home value — but it doesn’t. Of course the transit score will itself become a symbol, like tax rates. Also mobility and quality of transit are not the same thing. The public evaluates rail transit as higher quality even if the seat and the frequency and the amenities on the tram is the same as the bus. The map above illustrates the intensity of transit service in the City of Toronto by census tract. It was produced using publicly available data from the Toronto Transit Commission. The shading is determined using a unique formula that considers the service level at timed stops (measured as the average number of stops that a streetcar, bus, or subway makes per hour), which is then weighted by transit type (where subway=1, streetcar=0.5, and bus=0.25) within 1 km of the census tract’s centroid. Once again, the areas best connected to transit are located downtown, in close proximity to both the subway system and frequent streetcar service. Of course, you can see the shocking revelation that, when you give a higher weighting to streetcar routes than bus routes, areas with streetcar routes fare better than routes with bus service! My goodness. I like the travel time methodology better myself, and I think it’s closer in spirit to what WalkScore is intended to do: basically, see how much “stuff” can be reached within a reasonable walk from a given destination. The difference is that, for a given network, walking speed is pretty uniform, so it doesn’t matter whether you talk about distance or speed. Transit is much more complicated, involving travel speed, route frequency at different times of day, usefulness of route (it doesn’t matter if I’m next to a north-south subway station if I work in an employment area to the west), etc. Perhaps another key difference is that WalkScore is all about daily amenities that one would expect to have nearby for a neighbourhood to be walkable — grocery store, pharmacy, restaurants, libraries, etc. — whereas for a transit score, these uses are secondary to the commute trip. So a transit score might be a weighted index that compares the number of jobs with the travel time required to travel to them. It strikes me that, between the WalkScore and Mapnificent analysis methodologies / algorithms, there must be a happy medium that accomplishes this. By the way, another use for a Mapnificent-style analysis. Back in the 1940s when Toronto was planning its rapid transit network, the TTC prepared a pair of maps that were essentially heat maps showing travel time contours from Yonge and Queen (main downtown intersection) to all points in the city. (It wasn’t that far off from what you would see if you compared Mapnificent maps prepared in 5-minute analysis intervals.) The map on the left showed travel time contours with the then-current system; the map on the right showed the predicted travel time contours once the rapid transit network was completed. It was an effective way to show the real benefits that riders would experience. It would be interesting (and, with today’s technology, whether GIS or Google, surely easier) to use a similar technique show what the impact would be with various LRT proposals today. This is exactly what I want. Well, and another one for bicycling. It took me many hours of searching to first find the areas accessible to work by transit (especially since my wife and I both had different places to get), and then search for apartments within that area. If this process could be automated, that could be worth $100 to me, next time I move. Hi Jarrett, while you are correct that there should not be an arbitrary weighting by mode, it is entirely relevant to weight services by reliability. For example, a fully grade separated service, whether bus or rail, is much more likely to have a high on-time performance, while transit in mixed flow traffic lanes, whether whether bus or streetcar, may exhibit a greater variance in wait times for the rider. The weighting factor could be based on the likelihood of delay and the range of delays, using actual data. I completely agree with Joseph. I may be moving to DC, so Ive been getting a general idea of apartment pricing….but I also have to look at google maps + badly designed transit websites to figure out if a certain area is within 30 minute of the potential job site…and then later I’d have to also factor in supermarket access. It’s a giant PITA. Mapnificent is a good start, but it could be even better. As Jarett points out, TransitScore’s current algorithm uses mode as a proxy for speed. Rather than assignign arbitrary weightings, it would be better if TransitScore looked at the average speed by mode for a given transit system, and used the relative speeds to generate the weightings. (So if a given mode is twice as fast as bus, then it would get a weighting of 2). As I think about this, the key is to get the algorithm right. For better or for worse, most people value rail over bus. But maybe not as much as .5 vs .25. Yes, speed counts, and frequency. Quality of ride counts too – seat quality and harder to define like how clean the stations are and if I have to stand out in the cold at a bus stop or can wait indoors on a bench. Perceived safety counts (more than real safety). Before you rely on Mapnificent you need to make sure it includes all transit systems in its calculation. For example, the Mapnificent for Los Angeles does not include services operated by Long Beach Transit, which would make the unsuspecting user think that if they lived in Long Beach they would mostly have non-existing transit options. Has the “transit travel time tool” not been updated for Link in Seattle? From what I’m seeing the Transit Score is using mode as a proxy for frequency. Why not go through each individual route and come up with a frequency score for it the individual route, then use this within the mode calculator. Since transit schedules change only three or four times a year this isn’t that much additional calculation..